The Warner Team started work earlier today, but it was hotter with less of a breeze than yesterday. So we still have a bit of a rock pile to finish moving after our mid-day lunch and short rest. Steve is going with Michael later today to purchase some shovels and pickaxes to clean the surface of the terrace where the rocks had been piled up so we can start digging a huge trench (about 5 feet wide and 4 feet deep) where the retaining wall will have its foundation. 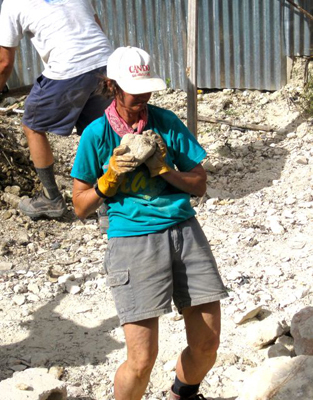 Steve took some video of Lena on the roof top helping with the cement operation that has been going on all day so far. She is a wonder at making connections with people. 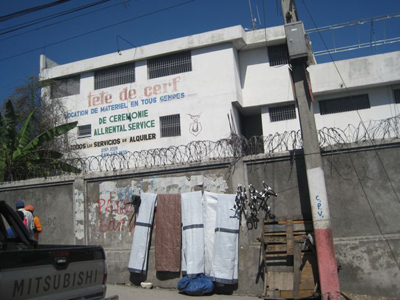 The roof laborers are employed by St. Joseph's for $12.50/day, about twice the going rate here in Haiti. This morning, Susan went with the Director, Michael, and others to the food market to try to find a working ATM. They are almost nonexistent here in Haiti - also no Starbucks, McDonalds, or Burger Kings! Yes, Virginia, there is a place with no Starbucks! Lena said she saw a Dominos Pizza on her 6 am run. Food prices were surprisingly steep, about twice as much as in the U.S for things like milk, peanut butter, olives, and chocolate, all things that require refrigeration or import. 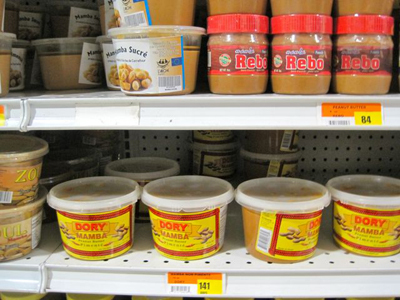 I'm including a photo of the interesting peanut butters. The electricity is off again. It comes and goes. Peter Graeff and Sylvie came for supper last night. It was very good to see our former Warner member. Doug and Peter discussed old times when they were growing up together in Kensington. After discussion, it was decided that we are all going to La Gonave on Thursday. 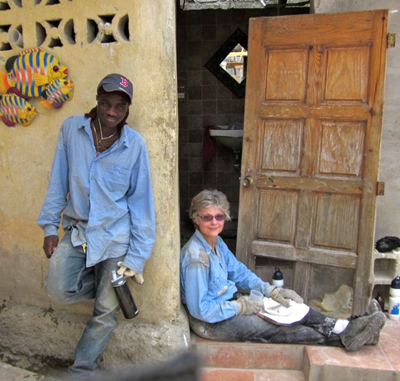 Peter feels it's important to understand what he and others have been doing for Haiti and with the Haitian people. Both Doug and Susan are going to take something to prevent seasickness (mal de mer, or it that nightmare?). Some French has helped us read signs and communicate, but Haitian Creole is quite different from French. We are all learning!